With the Democrats tooling up for their convention this past weekend in Denver, weather tried to steal the show for a bit with a long-lived landpout tornado (see picture sequence courtesy of KUSA above) just southeast of the Denver Metro area. The setting was fairly typical for landspout tornadoes (a form of non-mesocyclone or non-supercell tornado) near Denver, with a boundary NE-SW across the metro area (see surface map above). Storms formed along this boundary just south of Denver between 4:00 pm and 5:00 pm MDT. Then another sharper southeastward-moving boundary moved off the foothills to the west (see radar image above), and collided with the storms over the southern metro area. These colliding boundaries and the storm updrafts stretching the vorticity ("spin") along them produced the long-lived landspout tornado over northeast Elbert County between 5:30 PM and 6:00 pm MDT, as well as a couple other briefer landspouts elsewhere along the line. A sharp windshift boundary (or colliding boundaries in this case) is the most important component in landspout cases, providing the vertical "spin" to be stretched into a tornado. 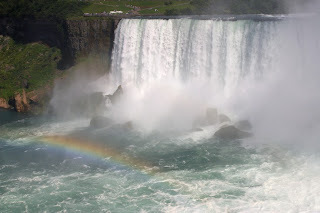 But the environment contributes as well, with strong surface heating and rapid temperature change (steep lapse rates) in the lowest 2 km or so, helping to accelerate air parcels upward in low-levels to augment stretching by storm updrafts along the boundary or boundaries (see Davies and Caruso 2005 at http://www.nwas.org/ej/cardav/). Such environments are similar to those that encourage dust devils on hot days. Above, a RUC analysis profile in the southeast Denver metro area shows these very steep low-level lapse rates, and also the deep well-mixed moisture layer, even though cloud bases were high (MLLCL around 2500 m AGL). I used to think that some low-level CAPE (e.g., CAPE below 3 km AGL) was needed in these events, but I've seen several Colorado events in recent years where this just isn't the case. It seems that a deep well-mixed moist layer (to reduce parcel entrainment and drying) with little if any CIN (to let parcels rise rapidly) is what is really needed, along with the steep low-level lapse rates, and of course, the boundary or boundaries. These ingredients thrown together in the same area increase the chance of a mesoscale "accident" that might result in a landspout tornado. With the local topography around the Denver area that can help set up boundaries on days with steep lapse rates, such events are relatively common there. 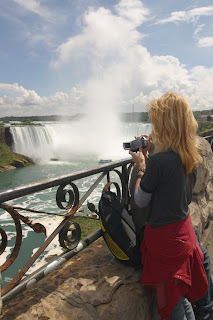 This isn't directly related to weather, but Shawna and I went to Niagara Falls last weekend for a very pleasant trip. The sky was picturesque with lots of bubbly cumulus clouds against crisp blue, courtesy of an upper trough with cold air aloft moving through. 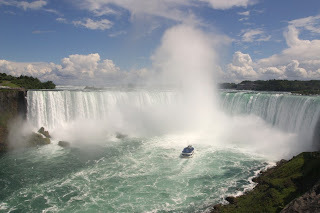 With that as background, the falls were truly beautiful! Above are some photos. 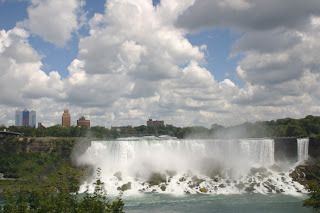 The first is the American side of the falls, with the city of Niagara Falls, New York, visible. 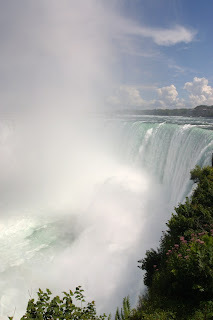 But I think the Canadian side of the falls is more magnificent, in the remaining shots. Shawna, as seen in the second image above, agrees. Enjoy! 6/11/08 Little Sioux-Moorhead, Iowa tornado path revisited - solving a "mystery"
The Little Sioux campground EF3 tornado was one of the more publicized tornadoes in 2008 because of 4 boy scouts killed when it destroyed a bunk house where they had been drilled to take shelter (see my earlier post in June). Near the end of the 14 mile track (see first map shown above), this tornado struck storm chasers Kelly Martinson (also known as Kory Hartman) and Kenny Allen as it crossed Highway 183 a couple miles southwest of Moorhead, Iowa, yielding the most impressive up-close example I've ever seen of what it is like to encounter a rain-wrapped tornado. Contrary to some speculation by other chasers online, Kelly and Kenny did not intend to get that close, as the tornado was embedded in rain and the Omaha radar went down near the time of their encounter, making it difficult to judge where the tornado was as they waited for the mesocyclone to approach from the southwest. Also above are images of the same rain-wrapped supercell near Moorhead (observed by storm chasers from Iowa State), and later northwest of Dunlap (from the viewpoint of Shawna and myself). The ground survey by NWS Omaha the day after the tornado suggested that the tornado did not cross highway 183 southwest of Moorhead, but Kelly and Kenny's video and their personal survey information indicated that it did (see the second map above, a Google maps closeup of the path end showing the discrepancy between the 2 survey tracks). To solve this mystery, Shawna and I revisited the area southwest of Moorhead on a trip to Iowa about a month after the tornado. Using a reference copy of Kelly and Kenny's video provided by Doug Kiesling (see video grab insets on second map above), Shawna and I located where the tornado crossed the highway (see third map above, my own survey of the tail end of the tornado track). 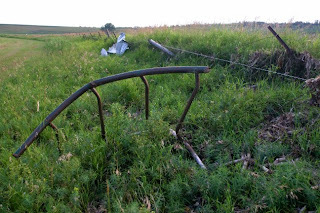 From fence damage just west of highway 183 and south of 314th street (see photo above), it was clear that the most intense part of the tornado (50-100 yards wide) did indeed cross the highway where Kelly and Kenny's map indicated. We also found the two broken road signs that are seen being snapped off in Kelly and Kenny's video. Without the video the day after the tornado, it would have been easy to miss this damage, as the fence is located below and some distance west of highway 183 in a treeless area, and the broken signs were hidden in tall grass. Tree damage along and north of 314th street (what was shown as the center of the tornado path in the official survey) appears to have been a result of the north edge of the broader tornado circulation, or possibly inflow winds coming into the tornado from the north or northeast (see my close up map above). This example goes to show that surveying damage is difficult, and not always an exact science, particularly in rural areas. Also, important to note: The intensity of the low-to-the-ground fence damage lined up with highway 183 strongly suggests that, had Kelly and Kenny been located another 50 yards southwest on highway 183, their vehicle would most likely have been rolled off the highway down a steep embankment, possibly resulting in injuries (the swirling condensation marking the most intense part of the tornado can be seen passing just south of their vehicle on the video). So, they are very lucky... as is the occupant of another vehicle (tail lights seen on the video) a few hundred yards farther down the highway (the most intense part of the tornado passed between the two vehicles). This is a graphic illustration of how dangerous it is to chase high-precipitation supercells with rain-wrapped tornadoes, as well as the potential problems of relying entirely on radar information when you can't see very well.